When running backup-spsite on a large site collection, say it’s greater than 20GB, you look at the backup directory and see that your bak is showing 0 in size after say 15-30 minutes, and your SQL server has 24 GB ram and your SharePoint server where your running the backup-spsite has 24 GB of ram. 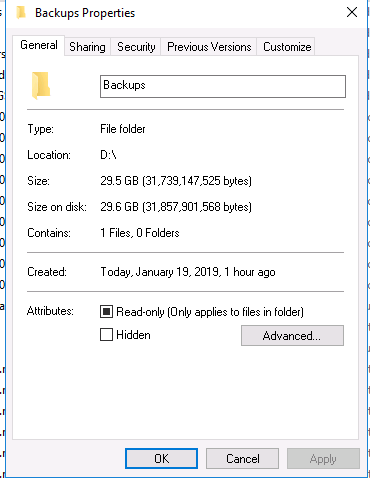 One thing you can do to get windows to show you how the file is progressing is to right click on the directory where you’re backing up to, say d:\backups (because why try and write to the OS drive? I mean isn’t that OS Drive getting beat on harder than a teenage boy who just discovered Jergens, or some other lotion, anyway? And sometimes, this jerks windows into realizing that the damn file is growing and then when you look at the directory, err look inside, then your file shows the actual size, or a close proximation. Wish I would’ve discovered this little gem earlier in life. Many a backup-spsite I did cancel thinking it was not working. Imagine if you will, that the picture below showed 0 for the size and 29.5 for the size on disk. That is what I first saw, but didn’t take a crime scene photo (aka screenshot). Had I thought to do that before I thought about sharing this, you would have seen a better representation of SharePoint’s reality (note: not our reality, it has its own perception). The file system was showing 0 KB, then after asking for the directory properties, I could see that the file was indeed growing. And if you know, roughly the size of your content db holding the site collection, you can gauge how long it will be before it’s time to do the restore. Notice the size on disk. Had I taken the screenshot when I first looked, when the file size in the file system showed 0 KB after over 30 minutes of backup-spsite running, the example would’ve been better, as it would’ve shown you, zero for size, and size on disk shows you the size. Then when you click OK, usually the file system will no longer show zero. You still need to let the backup-spsite finish though, Tex. Don’t get carried away and have a great time SharePointing!